This amphibian was photographed at Judd’s Lagoon in Queensland. It has been identified as a juvenile cane toad on Frogs.org.au. I suspect it marks the front line in their colonization of Australia. The story of how cane toads got here is an object lesson in the unintended consequences of introduced species. They arrived in 1935 following the apparent success of these toads saving sugar crops from beetles in Puerto Rico and Hawaii. Australia proved to be paradise for the cane toad, and they set about eating rodents, reptiles, other amphibians, birds, bats, invertebrates, plants, dog food and even ping pong balls. In fact anything they could fit in their mouth apart from the cane beetle that they were introduced to control. 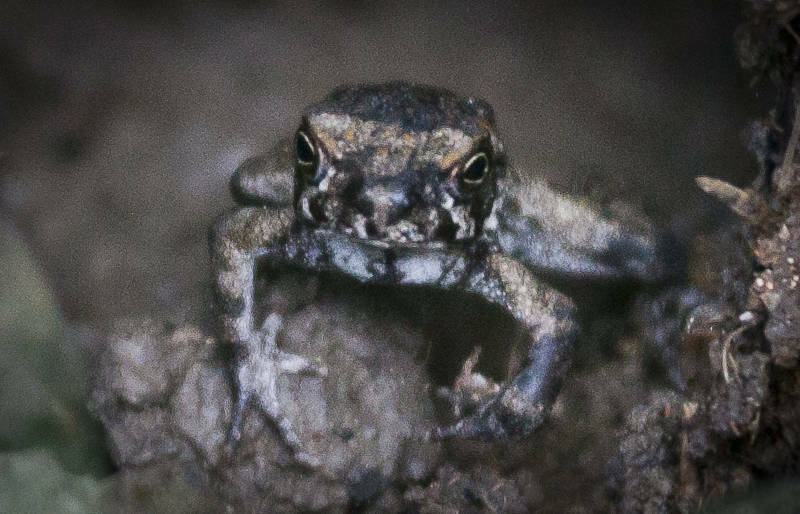 A single toad can produce 500,000 tadpoles in her lifetime. Native animals suffered a triple whammy. If they could avoid being eaten by the toads they would find their own food supply depleted by them. They die if they eat the toads because the skin is toxic and glands behind the eyes secrete a milky white poison which is strong enough to kill a human.